Discussion in 'Plugin Requests' started by tspierer2, Oct 10, 2018. 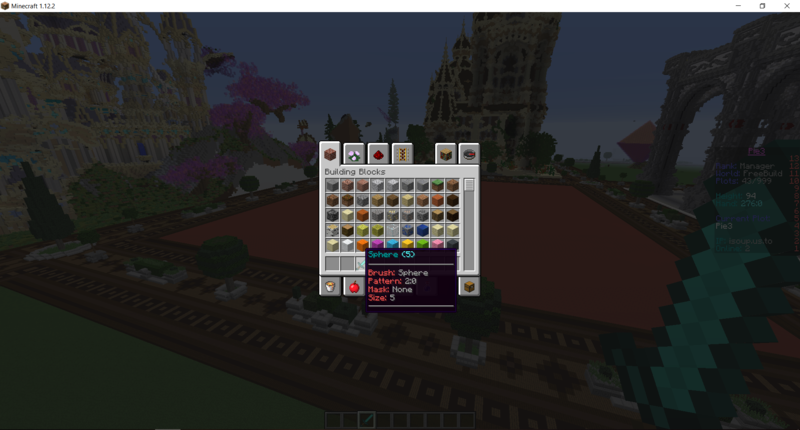 What I want: When you use worldedit //brush or voxelsniper /b I want the tool you're using to be renamed and have a lore of the brush information, that way when you are using multiple brushes in your inventory you know which one is which if you forget. This really helps with creative servers and has not been done before. When you do /none the item name resets back to default. I hope there is a good way to sync the brushes with this plugin instead of having it be renamed based on worldedit commands. -If possible a config for customizing the name and lore of the brushes or at least the colors. When I'd like it by: Yesterday. Simple concept but hopefully not difficult to make, thank you all, ask me in the comments if you need me to clarify anything, I know there is a lot more to it than one brush example. If this is too much work, I would be very happy with even just the name part, without the whole lore concept. Do you still need it? If so and no one else made it before next weekend, I'll see what i can do. I gave it a try in a short break. So I made an extra command /ibrush. Currently, this command works perfectly for a sphere. The lore and the name are configureable in the config with custom variables. Which other commands should absolutely affect the lore for WE and voxelsniper? I thought about /brush sphere, /brush cylinder, /brush smooth and /mask but I'm not a good builder so there'll probably much more important commands . Let me know if you want some things to be changed . Oke. Do you know how I can import the brush type etc. from the worldedit API? Right now, I'm indeed adding each command and checking for each parameter whether it's valid or not. It would be much easier to just get the information from WE itself, like you said. If i now type /ibrush sphere stone (default size is 2) or /ibrush sphere -h stone 2, then /mask grass_block, then /ibrush sphere sand 5, etc.,it works fine. I can override the short form /br, but not the /brush command. (I have no idea why.) I'm done with my exams next Monday, so from then, I've got much more time to think about it . [Edit] Just found out how I can use the WE methods to get the brush and mask. The plugin is now able to detect the brushtype, size and pattern materials from WE. I only have to figure out how I can get the mask materials. I'll also have to recode it a bit to fit the older version. It was quite hard for me to figure it out without correct source-code, so if it's done, I'll change it to the older version to know what I should change. Thank you for giving me this experience! This way, I learn much more than just the easy small plugins I made for myself . I took me a while but I finally finished your plugin. Let me know if I should change something. Thanks to @Pie3. He removed all bugs and glitches.